This teen was active in dance and yoga prior to beginning Schroth PT. Please note the effects on her posture. Front view: shoulders are level, shoulder and trunk are centered over her hips, less pronounced left lower rib, improved trunk symmetry and muscle tone, arms hang equidistant from her body. Side view: less low back curve, neck is more aligned with her shoulders, less rounded upper back curve. Schroth Scoliosis Physical Therapy is a conservative treatment for the management of scoliosis and kyphosis in children and adults. The Schroth method is different from standard physical therapy exercises because it identifies and treats the 3 dimensions of a scoliotic curve.The exercises are modified to each person’s curve pattern, curve severity, stage of growth and fitness level. This therapy is appropriate for children and adults whose curve is greater than 10 degrees, before surgery, after surgery and especially if surgery is not indicated. They are designed to elongate the trunk, derotate the spine and correct postural imbalances in the body. By developing the inner muscles of the rib cage through corrective breathing techniques Schroth exercises can change the shape of the trunk and improve spinal abnormalities. Postural awareness is learned through the exercises and incorporated into daily activities to achieve the best postural stability. The goal of Schroth therapy is to slow or halt the curve progression, improve postural stability and core strength, decrease pain, improve mobility and cardiopulmonary function. The Schroth therapist works with the patient one on one for 60 minute sessions. The therapist guides the patient through the exercises using tactile cues, verbal cues, and visual feedback so the patient can learn how their body looks and feels performing the corrective exercises. This better enables patients to incorporate the corrections into their daily activities. Exercises are performed in various positions using props to facilitate the corrective posture. The patient must perform a home exercise program 30 minutes, 5 days a week, to achieve and maintain maximal results. 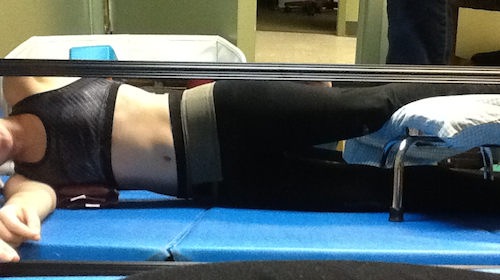 It usually takes 10-20 sessions for a patient to be independent in the Schroth method. At that time the patients is discharged on a home program and asked to follow up in 2-3 months to review the exercises and advance the program. Follow up treatment sessions will review the exercises and postural corrections from the previous sessions and advance the program as appropriate.